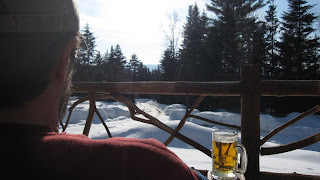 Adirondack Lifestyle ™: Porch Time Returns To The Adirondacks! Love this! It's been so nice the past couple of days, I've been tempted to throw on a bathing suit and full-on sunbathe on our falling down deck. But I restrained myself. Plus, I'm still not over basking in the glow of our new wood stove. Oh, the difficult choices I must make. Poor Jess, faced with all those new, difficult Adirondack choices! Such as which kind of LPPB micro brew will you choose this Tuesday? Good to hear you are enjoying the new stove.